These are said to be the oldest works in Longton and to be contemporaneous with those of Wedgwood at Etruria. They were originally carried on by Cyples, afterwards by Cyples and Barker (1846), who were succeeded by Thomas Barlow. For many years, Egyptian black and other tinted bodies only were made, but these were of a fine and very superior character. Lustre ware was also produced, and some of this was marked with a large letter B impressed in the body. Later on, china for foreign markets was produced of good average quality both in body and glaze. Mr. Thomas Barlow successfully turned his attention to the production of the most costly classes of decorated goods for the home markets in about 1870, and these have an excellent body and glaze. In 1871, Mr. Barlow exhibited some of his productions, which attracted much attention; some of these are shown in Figure 18. Tea, breakfast, dessert, and dejeuner services, and a number of ornamental articles in every style of decoration, were made. 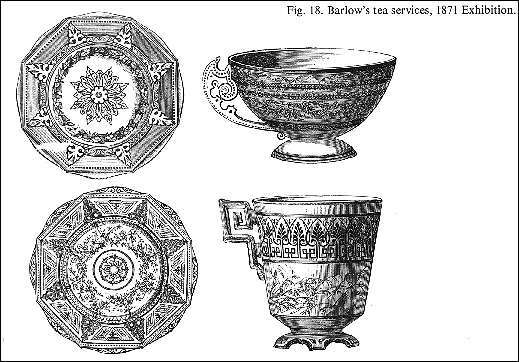 Many of Mr. Barlow's designs and patterns were original and worthy of commendation. Thomas Barlow ceased potting at Market Street in about 1883.